This past Tuesday, April 3rd 2018, as part of my Tuesday's Truths series, (published here on Blogger) I mentioned in my post that April is National Gardening and Lawn Month. Today, I'm adding a memo to that entry by reminding you that April is also National Poetry Month. In honor of this fact, I've put an image of Wendell Berry's poem, THE PEACE OF WILD THINGS, atop this posting. 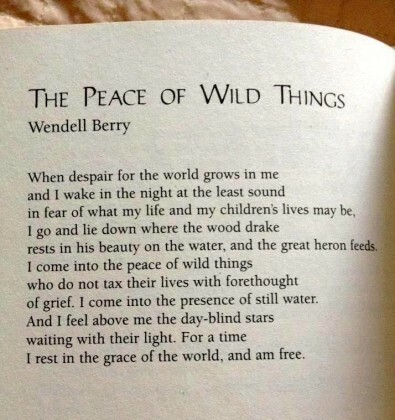 I learned of this the poem through Chris Deatherage, the man who designed my website, patriciayoungquist.com. Additionally, as many of you know, Chris also has created other materials for me (including business cards and press releases). Moreover, he edited and formatted volumes one and two of the Words In Our Beak series (which are pictured below). 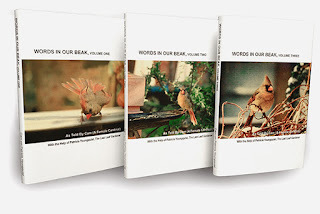 A fact worth mentioning during this National Poetry month is that in volume one of this book series there are references to poems, including ones by ones by Joyce Kilmer and Longfellow, poets which I've discussed in prior entries here on Blogger. Moreover, I've also written about National Poetry Month here including an entry (4-6-2017). Btw, others who have published poems have also been featured here on Blogger and since it is National Poetry Month, you might want to check them out. They include (in alphabetical order): Raymond Carver, Geoffrey Chaucer, e.e. cummings, Emily Dickinson, T.S. Eliot, Thomas Hardy, Joni Mitchell, Mary Oliver, Sylvia Plath, Edna St. Vincent Millay, and William Wordsworth. Hope you get a chance to enjoy checking poetry during this National Poetry Month. I also hope you are able to enjoy this National Gardening and Lawn Month by spending time in the great outdoors. 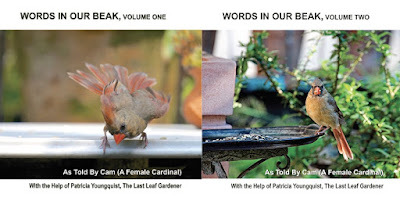 Remember you can enjoy poetry through the eyes of Cam in volume one of her series, and you enjoy urban gardens through both volumes of Words In Our Beak because the stories are set in my rooftop garden.